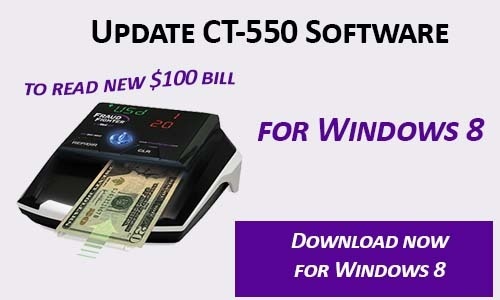 With the occasional release of newly designed banknotes, some software-based currency verification devices, such as the CT550, will need to have their software upgraded to the newest version. Without the upgrade of the new software, your machine will be unable to detect banknotes that were released into circulation after you purchased your product. 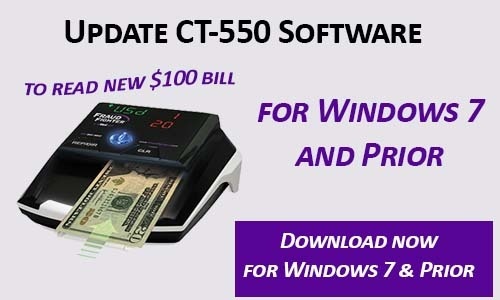 The new currency software for the CT-550 and CT-2000 automated currency detection units are available. Click below to the link that is associated with your product for instructions on how to upgrade your software. Be sure to select the right download depending on the type of Windows Software you have. If you need to update the software for your CT-2000 detector, please call our office. We will need to ask you a few questions in order to determine the best method to deliver the necessary files and instructions to you.